Get ready. Today, you’re in for a good ol’ fashioned food fight! Don’t pretend like you don’t love those. Three similar items are going to face off to determine who the winner is. We all know that price comparisons are vital to a frugal food budget, so the winner will be determined by value. This time we’re going to get downright Middle Eastern with Hummus. Though hummus originates in the Middle East, it has recently made the long journey to American kitchens, and we’re all better for it. The hippies of the 60’s and 70’s (you know who you are! ), were some of the first Americans to give it a go, but hummus has gone mainstream in the last 5 to 10 years. It’s not just for vegans and vegetarians any more. Sales are growing exponentially with no signs of slowing down. So, what is hummus? It’s remarkably simple. Hummus is pureed chickpeas with a few different spices and flavorings. The most basic varieties include garlic, lemon juice, and maybe some tahini. That’s about it. Chickpeas (or Garbanzo Beans) are actually the most widely consumed legume in the world. Hummus can take credit for much of this, but chickpeas are also pretty great by themselves once soaked and cooked properly. My wife and I love them in salads. They’re a great source of protein and are very low in calories. However, there’s one big problem. As much as I love hummus, it’s awfully expensive. Have you looked at the prices at your local deli recently? It’s enough to make you drop to your knees and cry. So, what we need is a no-nonsense price comparison. We need a food fight. Talk about a big difference! The first photo demonstrates Cedar’s Hummus, which was the least expensive hummus I could find at my local market ($2.50). The other brands were usually priced between $3 and $4. The second is a super easy homemade version prepared by yours truly. You get more than 5 servings (1/4 cup per serving) for only a quarter! What other healthy snack boasts that kind of frugality? The bottom line is this: We all know that homemade usually wins the price comparison over store-bought, no matter what the product. However, some foods barely win out and other foods simply blow away the competition. Hummus is one of the latter. I simply can’t think of a plausible explanation why it costs so much in stores. It’s 95% pureed chickpeas. Do you know how cheap dried chickpeas are?! The only reason I could come up with is that it’s still considered a specialty item. Even with it’s recent acceptance, hummus is still considered slightly exotic, and therefore, companies can get away with charging more for the mystery. I’m here to take the mystery out of it. It couldn’t be simpler or cheaper to make. Here’s an easy recipe to get you started. 1. Combine all of the ingredients other than the water into a quality food processor or blender and let it do its thing. 2. Add some water 1/4 cup at a time and continue blending, scraping down the sides occasionally if needed. You can add more or less water than suggested, depending on your desired consistency. To cook dried chickpeas, first soak them over night in cold water. Then, bring the soaked chickpeas to a boil in plenty of water and reduce the heat to a simmer for 1 1/2 hours to 2 hours until tender. Leave the lid of the pot tilted slightly to allow some of the steam to escape. If you’d rather, you can cook them in a slow cooker instead. If you’d rather just use canned chickpeas (already cooked), just realize that you’ll probably be paying more like $0.12 to $0.15 per serving instead. The main thing missing from my recipe, that most commercial hummus has, is Tahini. It’s an oily paste made from sesame seeds. I don’t think it’s necessary, but if you miss it, go ahead and add it in next time. You could also add olive oil if you’d like. Try 3 Tablespoon of oil and 1/4 cup+ water instead of 1/2 cup of water if you’d like a richer flavor. 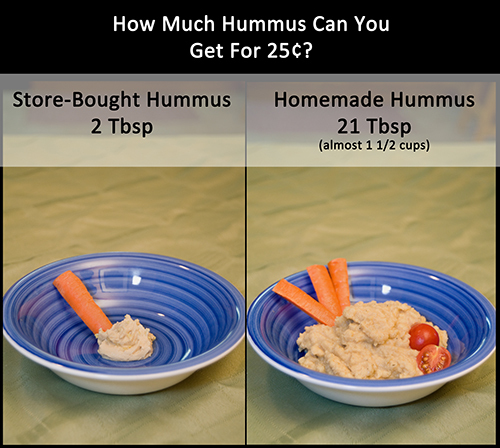 Either way, it will still be much cheaper than buying your hummus already prepared. Another delicious option…swap the onion powder for 1 teaspoon cumin and 1/2 teaspoon chili powder for a more Southwestern flavor. Be creative when making hummus. There are hundreds of possibilities! This article is part of a series called Photo Food Fights at Simple Family Finance. You can find this recipe and over 150 other deliciously frugal recipes in Chris’s book, Eating Well For Only $2 A Day! Great post! I love seeing articles that address issues of both health and finance. It is possible to eat healthy foods on a budget. Hummus is a staple in my household, but I admit I’ve never made it from scratch. I’ve been fortunate enough to be able to buy it really inexpensively (even free at times) by matching sales with coupons. So that is possible. And it freezes well so you can stock up when the price is right. But I’m going to try making my own the next time. I have everything but the chickpeas, and we have a great bulk foods store here where it’s easy to buy just what you need for a recipe. Thanks Susan. I actually just wrote an article on my blog about the myth of cheap foods having to be unhealthy. So, I’m totally with you. Give the homemade stuff a try. Like many of the other comments say, this one doesn’t include Tahini, but it’s very good and VERY inexpensive this way too. I’m sure this is a very tasty recipe. With respect, however, this is American chick pea spread. Middle Eastern Hummus always has tahini in it. Tahini is sesame seed paste. It contributes significantly to the flavor and consistency of Middle Eastern Hummus. Tahini really does add to the flavor– and the cost, but a jar will last a long time when being used to make hummus. I just made hummus last night and it was super easy and tasty. I made my own tahini with about $1 worth of sesame seeds I bought at my local bulk store and a bit of olive oil. I just lightly toasted the seeds in the oven and pureed them in my food processor. I had quite a bit left over for about two more batches of hummus. Ana – I must say I’ve never tried making my own tahini. I’ll have to give it a shot. If you ever do, I’d love to hear about it. Tahini is super expensive – that’s why I’ve never made my own hummus. A friend told me to use Greek yogurt instead of tahini. I like it but it does make it a little more expensive to make, but I didn’t even know what tahini was the first time I made hummus. I never thought of making my own tahini before. Thank you so much! Thank you for sharing this!! I’ve been thinking of making my own tahini forever and never have. NOW, I know it can be done. Woot! That’s a good point Roxanne. I didn’t include it in this recipe because I wanted to show that you can make a versatile and healthy dip for only a nickel per serving. Most people don’t realize this. We make homemade hummus all the time. Tahini is not too expensive and lasts forever, but I’ve also heard you can sub peanut butter. If you sub in PB it will be tasty but it won’t be hummus. I agree and it isn’t really Hummus unless the Tahini is in it, we are Lebanese and grew up on this food, to savor the flavor you need all the ingredients and Tahini is a major one! I have never used anything but tahini myself, but just was offering another suggestion as it was something I heard. I agree, the texture and flavor of tahini is crucial to the final product. Any good websites for buying dry chick peas at a good price? They don’t sell them at our grocery stores. That’s unfortunate. Honestly, I’m not sure. I just buy them at my local Wal-mart. They’re in with the rest of the dry beans. I love hummus, but think that it’s really lacking without tahini and olive oil (and is more just a regular american bean dip than a middle eastern hummus). This is the recipe I use. There’s something about the order of putting the ingredients in the food processor that makes an emulsion, and extra fluffy hummus. Put the chickpeas, salt, garlic, cumin, and cayenne in a food processor and process for about 15 seconds. Scrap down the sides of the processor. Then add the lemon water mix through the feed tube with the processor running for about 1 minute. Scrap down the sides several times. Then add the oil and tahini, with the processor running, until the hummus is fluffy. This is a perfect authentic recipe!! Thank you so much for posting this! I wasn’t happy with the lack of tahini and olive oil in the original recipe either, but this looks perfect. I am saving it; thanks! Awesome, thanks so much! My only attempt at making hummus was a flop. I don’t think I had a real recipe and it tasted like tahini more than hummus! How much Tahini would you add to this? Pour the sesame seeds & olive oil in food processor. Process on high speed until the paste is desired consistency. Drizzle in additional oil & process on high until desired consistency. I store in glass jar with screw on lid in refrigerator. Thanks for the Sesame Tahini recipe. I have made hummus and just used tahini from a jar. One jar of tahini made a lot of batches of hummus for me, but making the tahini would be even better. I just had not thought of doing that part. Thanks! You’re welcome!! You can try 1/2 or 1/4 batch to see if you like it. Just keep adding more oil until you have the desired tahini consistency. You may want to use 1/4-1/2 the amount of tahini you think you’ll want in the hummus, & taste before adding more. You cannot take out; but you can always add in more!! Make it how you like it if you’re the one eating it!! Given how long it takes to cook the chickpeas, did you factor energy cost into your calcuations? I think the author’s point is that you can simply make it cheaper homemade than store bought. I’m not the OP but I just started a batch of chickpeas in my crockpot with the kill a watt attached. I,ll report back the energy use. I cooked chickpeas all day in my crockpot and ended up with 2 kilowats of electricity used or roughly 18 cents. Anyway it should not be the reason anyone skips cooking dried beans. Also much less packaging than either cans of beans or plastic tubs of hummus. If you remove the outer shell from the chickpeas it will have the creamy consistency that store bought does. took me YEARS to figure that out! Just curious – do you have a great method to de-skin the garbanzos? It is pretty labor intensive the way I do it, and I can’t figure out another way. Great post. I’ve been planning on making some from scratch for a while, so now I’m really inspired to get going. The store kind is not as good as the restaurant kind, and I’m hoping that homemade will taste as good or better than the restaurant kind. I also appreciate the comments on how to make tahini. I finally found some in our store last week, but was shocked at the price and did not buy. I think that it’s really lacking without tahini – in fact it is not hummus without it. Good point and nice comparison. But if you are going to call it hummus, it needs tahini. Definitely a doable ingredient, as many have pointed out! You know, I was aware homemade hummus was much cheaper than store bought, but as far as taste goes, the hummus I was buying (don’t know if it is proper decorum to mention the brand) was head and shoulders ahead of my homemade hummus in the taste department. The store bough not only tasted better, but it was so much smoother and creamer. I think my hummus was bland compared to the store bought because my hummus did not have tahini paste. But tahini paste isn’t cheap either. I tried using peanut butter in place of the tahini paste and I sort of liked it but my family didn’t. The taste was still not as good as the store bought. For that reason I stopped making my own and spent the extra money for commercial hummus. I can get a big 30 oz container for 5.99 – or less with a coupon – at BJs. But maybe I’ll try this recipe. I was using canned, not dried, chickpeas. Maybe that will make a difference. Ok, I should read other comments first. I see others have recipes for homemade tahini. I will have to try that. Hummus isn’t true Hummus without the Tahini in it!! Take it from a true Lebanese-American don’t leave out the Tahini! I can get good tahini pretty inexpensively. I think the stuff I have is actually imported from Lebanon. This is my favorite recipe. I agree – hummus needs tahini. But, if you don’t have time to make it, look for it in a middle eastern grocery store. Around here, the same bottle (even the same brand) is about a quarter of the price that a regular store sells it for. We love roasted red pepper hummus! This is on my list of projects to make before the end of the year. Thanks for sharing your recipe! Does anyone know how long this keeps in the fridge? That’s a concern of mine too. Can’t wait to try this. I keep my homemade hummus in the fridge for 5-6 days and then pitch any leftovers. I make traditional Middle Eastern hummus with tahini. Not sure if that would change if the tahini is left out. Better safe than sorry though! Another suggestion for liquid.. If you are using canned you can use that liquid instead of water or olive oil. That is what I do to make it lower fat. Neat! I’ll have to try this! Thanks so much for the basic recipe without tahini. I’m not a fan of tahini, but I love hummus. One thing I really like to add to mine are sundried red peppers. They provide a slight tang when combined with the lemon juice. Girl, we need to talk about hummus. 🙂 I disagree with you on making hummus without tahini. Tahini is what makes it ‘hummus’, and not just ‘ground chickpea dip’. Having lived in the Middle East, I have a definite opinion on hummus. While tahini used to be hard to find, I now see it everywhere. I also notice that you used very little lemon juice. Lemon juice is what gives the hummus that edge of tartness. And ONLY 2 cloves of garlic?? For the small, single batch, should be 4-6 at least. Olive oil is optional?? no, I don’t think so! You didn’t mention ‘peeling’ the garbanzos after they have been cooked (oh, btw, why not use a pressure cooker? well, I guess if you are only doing 3/4c. dry beans…). This is the step that holds me back from making hummus more often. I don’t like the texture of the skins in the finished product. My Lebanese friend that taught us to make hummus removed the skins. We salted the beans down & rubbed them between our hands, then under running water. Just to clarify, this was written by guest poster Chris. I drain them, then dump them onto a clean kitchen towel. Fold the towel over and roll it around a bit, rubbing the chickpeas together gently. Dump all the beans into a bowl, fill with water. Skins float to the top – remove with a slotted spoon, then drain the chickpeas again and proceed with your recipe. MUCH faster than any other way I’ve tried. I’m a huge fan of hummus. A local independent vegetarian restaurant here has the best next to the authentic Lebanese restaurants. I use cumin in mine instead of onion powder. When I make mine at home I go heavy on the garlic (I use several cloves and crush with a garlic press). One thing I noticed you are missing is Extra Virgin Olive Oil. Hummus is definitely not hummus without olive oil otherwise it will be dry. I make mine not only for cost but it’s healthier because I know what goes into and I use only organic ingredients. Thank you SO much for posting this recipe without tahini. I’ve developed an allergy to sesame seeds and thought my hummus eating days were over. Chris, thanks for a great recipe with variations! After reading the post, I made hummus with some chickpeas that I froze a while back just for this purpose. It turned out really, really good! I did use some Tahini, mostly because I already had some in the pantry. One thing I like about recipes like this is that you can customize them to your taste, so if you like more lemon juice or more or different spices you can easily add them in. I really appreciate that you mention this in your last 3 paragraphs. You can cook dried beans in the crock pot too. I throw a batch in and let it go all night while I sleep. It takes about 10 minutes of effort, and that includes bagging them in the morning to put in the freezer. To cook them in the crock pot add one pound of beans and six cups of water. It is also a good idea to add a sprinkle of baking soda, about 1/8 of a teaspoon in case you have hard water which prevents the beans from softening. The baking soda will ensure they soften. We have very hard water but have never had a problem when using a little baking soda. One pound of beans makes about the same as three cans. I can fit two pounds of beans in my regular size slow cooker, so I always double up. Enjoyed reading all the comments. I have been making hummus for years. To save money, I buy dried chick peas in bulk, cook them in bulk, and then freeze them in 2-4 cup portions. I also buy tahini in bulk from Amazon, and can usually split the order with a friend. Happy hummus making…definitely don’t leave out the tahini or olive oil. Thanks for the recipe Chris! It seems like there are some serious authentic hummus-lovers here! Hope all the “oh that’s not REAL hummus” comments don’t deter you from writing a guest post at another time. I for one really appreciated your post even though I too prefer tahini. I think most people were missing the point. 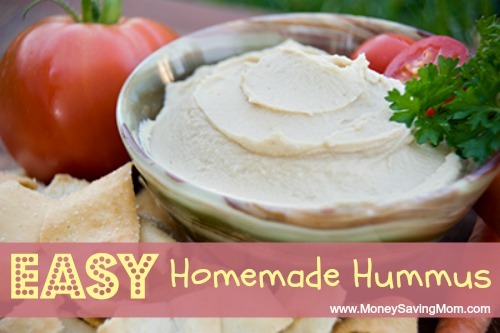 That you can make a healthy snack (call it hummus or don’t) for an inexpensive price! I agree! Whether it is true “hummus” or not, some people have sesame allergies or just do not care for the taste of tahini. It’s always good to have an alternative version! Thanks Chris for your hard work! Thanks for the simple recipe I’m excited to try this tomorrow! Glad you liked it Monica!